Sister Florence Hebeler, CSJ, 85, died August 29, 2016, in the 60th year of her religious life as a Sister of St. Joseph. 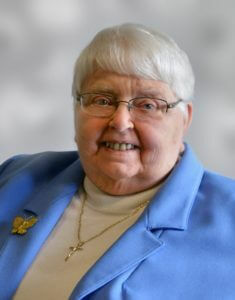 The daughter of L. William and Beatrice Widmer Hebeler, Sister Florence entered the Congregation from Blessed Sacrament Parish, Natrona Heights, PA.
For more than 35 years, Sister ministered primarily as a music and religion teacher and principal in the Pittsburgh and Greensburg dioceses. Known affectionately as “Sister Flossie,” Sister Florence served as principal of St. Mary in Kittanning (1987-1996), St. Bede in Pittsburgh (1981-1987), and Blessed Sacrament in Natrona Heights (1979-1981). Sister Florence received local media attention in 1968 when she was recognized as the first nun believed to be certified internationally in Eurhythmics, a teaching method that blends creative movement with music ability. She wrote that this style naturally appeals to children who, through this method and the “sunshine of God’s grace,” will approach the Liturgy with joy and appreciation. As Liturgist for St. Joseph Convent (2001-2013), Sister Florence was overjoyed when the chapel bells, which were in disrepair for years, started “ringing again,” thanks to a new computerized system. A Villa St. Joseph resident since 2013, she fully embraced opportunities to continue her passion for music, singing with the Villa Voices and playing the piano for residents. Full of joy and gentle in spirit, Sister Florence often referred to music as the universal expression to honor and glorify God and to bring people together. Sister Florence is survived by one niece, Mary Margaret Esler, Lower Burrell, PA, and the Sisters of St. Joseph of Baden. Friends will be received Thursday, September 1, from 1-8 p.m. and Friday, September 2, from 11 a.m. to 3:30 p.m. Prayer vigil will be Thursday, September 1, at 6 p.m. at the Motherhouse. Mass of Christian Burial will be offered at 4 p.m. on Friday, September 2. Burial will follow in the Sisters’ Cemetery on the Motherhouse grounds. Donations in the name of Sister Florence may be sent to the Sisters of St. Joseph Memorial Fund, St. Joseph Convent, 1020 State Street, Baden, PA 15005. Make a donation in memory of Sister Florence.